Things have gone well for the New York Mets early in the season. They are off to a 4-1 start, and it seems as if the good fortune will continue. On Thursday, the Mets activated outfielder Michael Conforto from the DL, far ahead of schedule. Conforto suffered a freak shoulder injury last August. The injury ended a brilliant 2017 season in which he hit .279 with a .939 OPS. Those are the kinds of numbers the Mets envisioned Conforto producing after he burst onto the season during their pennant-winning season in 2015. After undergoing surgery, the Mets originally set a return date of May 1 for Conforto. However, Conforto’s shoulder healed much faster than expected. He was even able to play in a couple Grapefruit League games toward the end of spring training. 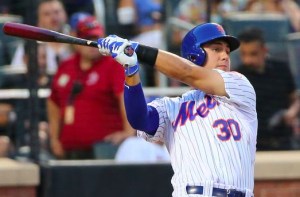 Even though he hasn’t played in any minor league rehab games, Conforto will be in the lineup for Thursday’s game against the Washington Nationals. Conforto will now become New York’s everyday center fielder. Most days, he will be flanked by Yoenis Cespedes and Jay Bruce, giving the Mets one of the more formidable outfields in baseball. Brandon Nimmo and Juan Lagares, who both played well the first week of the season, will be relegated to bench roles. However, both should be regular contributors, giving the Mets five viable outfielders on their roster. Having that kind of depth should help the Mets keep their three starting outfielders well rested. Conforto, in particular, may need to time off early in the year after an abbreviated spring training. Nevertheless, both the Mets and Conforto are confident that he’s ready to go and have another big season for the club. Of course, Conforto will still have plenty to prove upon his return. He’ll be the team’s primary center fielder, where he has just 44 career starts. Also, the Mets will face Stephen Strasburg and Gio Gonzalez in Conforto’s first two games back. But that’s a challenge Conforto is choosing to embrace. Naturally, there is some trepidation about Conforto coming back earlier than expected from a serious injury. But he’s going to be a big part of the Mets in 2018, so the sooner he returns to the lineup, the better. Fortunately for the Mets, they have confidence in their outfield depth in case they need it. That should help the Mets feel confident about Conforto’s early return to the lineup.